I thought I would start adding more money saving ideas for the iGreen Nutrition blog for those wanting to eat healthy on a budget. 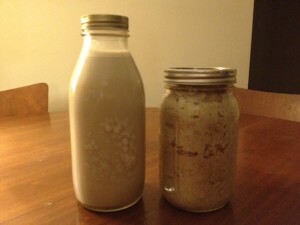 Here is a very versatile and inexpensive way to make a delicious enzyme rich seed milk and salad dressing or dip. I paid $3.59 a pound for sunflower seeds, which makes the milk and dressing very cheap and highly nutritious! To sprout the sunflower seeds, place 2 cups of seeds and cover them with water for about 8-12 hours during the day. At night, drain the water and cover. In the morning, pour water over the seeds and drain again. Place the seeds in a sunny spot and cover. They should start to sprout later in the day. Take 2 cups of the sprouted seeds and place with 3 cups of water in a Vitamix. Blend well. Strain milk with a wire mesh strainer and a funnel into a 2 quart glass bottle. Now you will have the milk and what will look like sunflower seed butter leftover in the strainer. Set this aside to use for the next recipe. Once you have strained all the milk, add vanilla extract, a pinch of sea salt and honey or stevia to taste. Combine ingredients in a blender and mix. If you want to use it as a salad dressing, add more water. If you want it as a dip, add more leftover seed butter. If you want to make larger quantities at once, be careful not the double the salt. A little bit goes a long way. Use within a week.